You have added Shine So Bright Textured Strapless Chiffon Dress in Cream into shopping cart. FINAL SALE. This dress is chic and refined, yet angelic at the same time. The Shine So Bright Textured Strapless Chiffon Dress is one of our very favorites! The top part is made of a unique textured fabric with a subtle stripe pattern throughout. It has a hint of shimmer to it. The sweetheart neckline, empire waist, and flowy chiffon skirt all combine to form a flattering silhouette. A hidden back zipper completes this dress. The Shine So Bright Textured Strapless Chiffon Dress would look perfect paired with pumps, strappy heels, or wedges and some pretty jewelry. 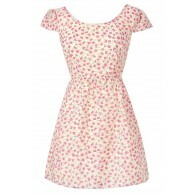 Toss a fitted cardigan or jacket over this dress on cool evenings when you need more coverage. Details: Fully lined. Hidden back zipper. 60% silk, 40% polyester. Lining: 100% polyester. Hand wash cold water separately. Color will bleed. No bleach. Hang to dry. Small measurements: Length from top of bust to hemline: 29". Bust: 32". You have added Shine So Bright Textured Strapless Chiffon Dress in Cream into Wishlist. You have added Shine So Bright Textured Strapless Chiffon Dress in Cream for Stock Notification. You have set Shine So Bright Textured Strapless Chiffon Dress in Cream as a loved product. You have removed Shine So Bright Textured Strapless Chiffon Dress in Cream as a loved product.